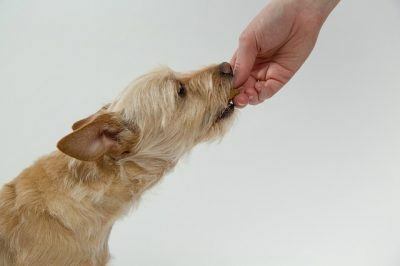 While it is usually a good idea to avoid giving your dog any people foods, most owners like to give their pet the occasional treat. And while moderation is important, the odd bit of human food isn’t a big problem for most dogs. Many fruits, for example, make great snacks for dogs, as they’re both nutritious and delicious. Most fruits are also full of water, which will help keep your pet hydrated, and some are full of antioxidants that’ll help support your dog’s immune system. But what fruits can dogs eat? You must be sure to stick to safe fruits, as many foods you eat all the time can be toxic to your pet. This even includes a few common fruits, such as grapes. We’ll try to help you avoid giving your dog anything dangerous below, as we detail some of the fruits that are safe to give your dog as well as some of the ones that are important to avoid. Although many people think of dogs as carnivores, they’re better described as opportunistic omnivores. And while meat makes up the bulk of the diet of wild canids (including not only feral dogs but wolves, coyotes, and foxes too), most will readily consume fruits when they are available. 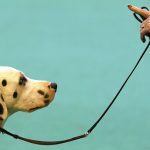 The digestive tract of dogs is much different than the digestive tracts of humans. It is relatively short and optimized for digesting proteins, but dogs can digest most fruits too. 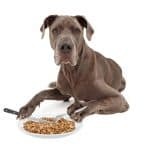 This doesn’t mean they digest all portions of the fruit, as the fibrous portions of the fruit, as well as any seeds present, will likely pass through your dog’s intestines unchanged. But the energy-rich cells of the fruit will provide calories, vitamins and minerals to your pet. Apples are low in fat and contain fiber and vitamins A and C which is beneficial to your dog. Be sure to remove the core and all the seeds. Apricot can also safely be fed to dogs. Bananas contain fiber, vitamins and potassium. In moderation, they make a good treat for your dog. Blueberries, raspberries, cranberries and strawberries, again in moderation, are a good source of antioxidants, vitamins and minerals. Mangoes and cantaloupe are both beneficial as they low in calories and high in vitamin content and fiber. They tend to be high in sugar so use sparingly. Do not forget to remove the pit. Oranges are packed with vitamin C and perfectly safe for dogs. Do remove the skin and seeds, however. Peaches and pears (fresh, not tinned) are also good for dogs but the pit must be removed as this is harmful to dogs. Pineapples peeled and cut into chunks provide fiber, minerals, and vitamins. They also have an enzyme known as bromelain which aids in the absorption of protein. Watermelon with the outer rind removed will provide the dog with potassium and vitamins A, B-6 and C. The high water content also helps keep the dog hydrated on hot days. Cherries are toxic to dogs due to the presence of cyanide in the fruit. It will cause damage to the cellular oxygen transport and can have serious consequences to the health of the dog. If your dog does consume cherries, look out for symptoms such as red gums, breathing difficulty and dilated pupils. If you suspect the dog has eaten cherries and these symptoms appear, consult your vet. Grapes (including raisins) are another fruit to avoid as they are toxic to all dogs. The consumption of grapes or raisins can lead to kidney failure which is a very serious condition. Tomatoes, yes they are fruit, are also potentially harmful, particularly the green parts of a tomato. They are not extremely toxic in small quantities but rather avoid them altogether to be safe. All citrus fruits will cause unpleasant side effects so avoid limes, lemons, and grapefruits. 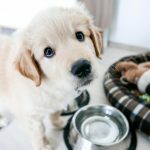 How Should You Prepare Fruits for Your Dog? 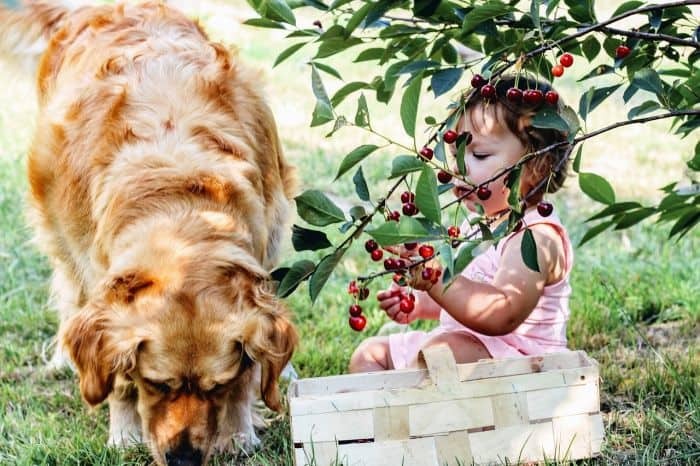 It is not only important to provide your dog with fruits that are safe and offered in reasonable quantities, you must also prepare the fruits properly before giving them to your pet. First, begin by washing the fruit thoroughly. This is important because agricultural products are often coated with pesticides, herbicides and fertilizers, which may sicken your dog. Additionally, fruits are often contaminated with a variety of viruses, fungi and bacteria, which can also cause health problems for your pet. 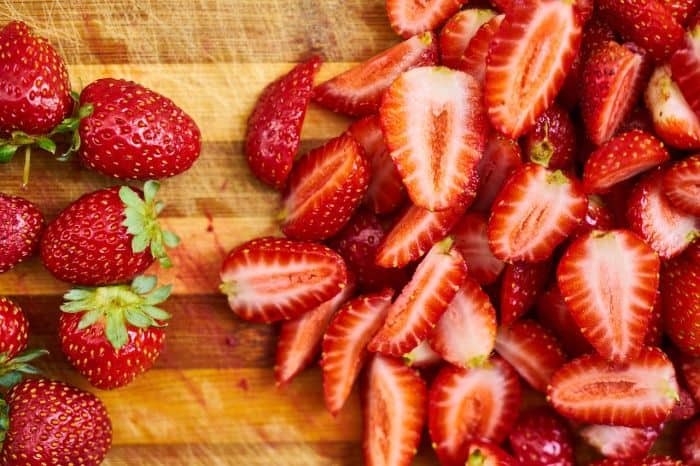 Once you’ve washed the fruit thoroughly, cut or tear it into very small, bite-sized pieces. 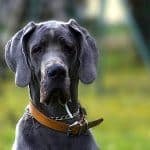 This isn’t always necessary – blueberries, for example, are small enough to offer to your pet as-is – but it is wise to err on the side of caution. If you aren’t certain that the fruit is small enough for your dog to handle, go ahead and cut it into smaller pieces. Finally, be sure to remove any indigestible parts that remain. This includes things like large seeds, pits, stems, leaves and skin. You want to provide your dog with only the edible, fleshy portion of the fruit. From this point, you can offer the pieces of fruit to your dog like treats, or you can add it to his food. If you like, you can even place the prepared fruits in a food processor and chop them up until they attain a paste-like consistency. This can actually be a helpful way of encouraging your dog to eat a food he normally refuses. Many dogs love fruits, and most varieties represent a nutritious and tasty treat for your pet. Just be sure to stick to safe, non-toxic fruits, and prepare them properly before offering them to your pet. 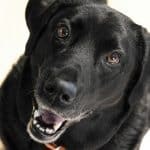 As long as you prepare the fruits properly and avoid offering them in excessive quantities, they’ll likely improve your dog’s quality of life.